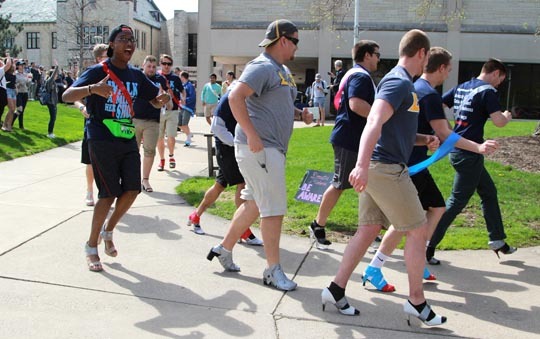 Nearly 100 men at The University of Toledo wore high heels and walked or sprinted across campus this week to raise awareness about sexual assault. The “Walk a Mile in Her Shoes” event raised more than $700 for the Bethany House, a local domestic violence shelter. Alpha Chi Omega and the UT Center for Student Advocacy and Wellness hosted the fundraiser, which was part of a series of events at UT for Sexual Assault Awareness Month. For the full list of events, go to utoledo.edu/studentaffairs/saepp/awareness-month.html. This entry was posted on Thursday, April 20th, 2017 at 3:38 pm and is filed under News, UToday .